Elder Angel Abrea, 47, of Buenos Aires, Argentina, became the first General Authority from Latin America to join the First Quorum of the Seventy when he was sustained the morning of April 4. He is currently serving as president of the Argentina Rosario Mission, one of the five missions in that country. Earlier he had been the first stake president in Argentina, and he has also served as a Regional Representative. Lady missionaries tracting in his neighborhood taught him and his mother, Zulema Estrada Abrea, the gospel. He was baptized at age ten in 1943. A three-year-old brother, Oscar, later joined the Church and is now serving as the bishop of the Buenos Aires Fourth Ward. His father, who died five years ago, never joined the Church, although “he always supported us﻿—in fact, pushed us﻿—to do our church assignments, and he always received the missionaries hospitably whenever they came. Since his death,” adds Elder Abrea, “I know that he has accepted the gospel. I feel it here,” and he touches his heart. “He was very, very proud of Angel,” adds Sister Maria Victoria Chiapparino Abrea. She began investigating the gospel when Elder Abrea’s mother invited her to come to Mutual at age fourteen. A year later, Angel baptized the fifteen-year-old girl, and three years later they married on 4 July 1957. He was twenty-two and just completing his degree at the University of Buenos Aires. They have three daughters, Patricia Viviana, 22, Claudia Alejandra, 20, and Cynthia Gabriela, 19. 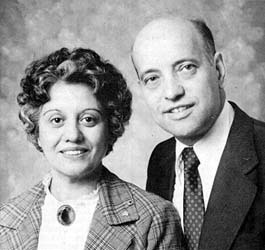 Their daughters accompanied them to Salt Lake City to be sealed in the temple 26 September 1966. Their lives have always been dedicated to the gospel, but it was on Friday, 20 March 1980 at 5 P.M. that the telephone call came that would now have them give an even greater measure. Elder Abrea relates that when an elder excitedly called him to the telephone﻿—“It’s President Kimball’s office!”﻿—and when President Kimball asked him to call Sister Abrea to the phone as well, “I knew something was happening.” Sister Abrea knew too﻿—from the first glance at her husband, chalky-faced and trembling. President Kimball, with President Romney on an extension, extended a calling to him to become a General Authority and, in the next sentence, added that he would also be called to be the first president of the not-yet-constructed Buenos Aires Argentina Temple. “I can’t remember what he said after that,” smiles Elder Abrea. Their daughters, guessing the news, surrounded them, hugging them and weeping for joy. It is appropriate that the call came through President Kimball. He had ordained Elder Abrea a high priest and set him apart as stake president, called him as Regional Representative, and called him to be mission president. “We love him very much,” says Sister Abrea simply. When Brother Abrea was learning English, he studied President Kimball’s articles and conference talks. For both, Church service has brought an increase in their faith. Possibly the most challenging calling was Sister Abrea’s service as an early-morning seminary teacher. “To support her,” says Elder Abrea ruefully, “I got up at 5 A.M. every morning. That was a challenge for the entire family.” She singles out those teaching experiences and her teaching in Relief Society as particularly faith-strengthening. He loves to contemplate the future of the Church in Argentina, where approximately 1,800 new converts are joining the Church monthly and where the next generation of leaders is growing up among 90,000 members who are confident and well-trained, and who represent all levels of society. “We have requests from businessmen and civic leaders with important positions to fill. They want Mormons,” he says. Elder Abrea’s church service includes callings as district president; branch president; counselor to a mission president; president of the Buenos Aires Stake, 1966–71; Regional Representative, 1971–76; Buenos Aires West Stake president, 1976–78; and president of the Argentina Rosario Mission, from which he will be released in July. Before accepting that last call, he was employed as a certified public accountant by Deloitte, Haskins & Sells in Buenos Aires. He also served as secretary of the treasury in the city of San Migurel, department (county) of General Sarmiento. Elder Angel Abrea, newly called to the First Quorum of the Seventy, and Sister Maria Victoria Chiapparino Abrea.